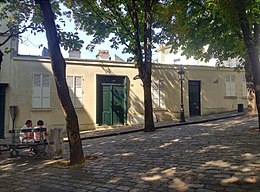 The Bateau-Lavoir ("Washhouse Boat") is the nickname of a building in the Montmartre district of the 18th arrondissement of Paris that is famous in art history as the residence and meeting place for a group of outstanding early 20th-century artists, men of letters, theater people, and art dealers. It is located at No. 13 Rue Ravignan at Place Emile Goudeau, just below the Place du Tertre. A fire destroyed most of the building in May 1970 and only the façade remained, but it was completely rebuilt in 1978. Formerly a ballroom and piano factory, Bateau Lavoir was squatted and divided into twenty small workshops in 1889. Distributed along a corridor, small rooms were linked without heating and with a single point of water. 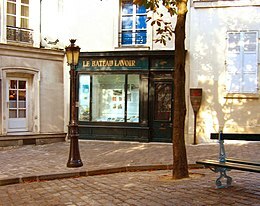 The name "Le Bateau-Lavoir" was coined by French poet Max Jacob. The building was dark and dirty, almost seeming to be scrap pile rather than a dwelling. On stormy days, it swayed and creaked, reminding people of washing-boats on the Seine River, hence the name. The building stands on a small cobblestone square that was known as Place Ravignan. In 1911, it was rechristened Place Émile Goudeau for Émile Goudeau (1849–1906), a popular novelist, poet, and journalist who founded Les Hydropathes, a renowned and famous literary club. The square now has a Wallace fountain and is planted with horse chestnut trees. Maxime Maufra (1863–1918) was the first noted artist to take up residence in Bateau-Lavoir, around 1890. Kees van Dongen and Pablo Picasso took up residence between 1900 and 1904. After 1904 more artists and writers moved in, including Otto van Rees, Amedeo Modigliani, Pierre Mac Orlan, Juan Gris, André Salmon, Pablo Gargallo, Max Jacob and Pierre Reverdy. It became an unofficial club that included artists Henri Matisse, Georges Braque, André Derain, Raoul Dufy, Marie Laurencin, Modigliani, Jean-Paul Laurens, Maurice Utrillo, Jacques Lipchitz, María Blanchard, Jean Metzinger and Louis Marcoussis; writers Guillaume Apollinaire, Alfred Jarry, Jean Cocteau, Gustave Coquiot, Cremnitz (Maurice Chevrier), Paul Fort, André Warnod, Raymond Radiguet, and Gertrude Stein; actors Charles Dullin, Harry Baur, and Gaston Modot; and art dealers Ambroise Vollard, Clovis Sagot [fr], Daniel-Henry Kahnweiler, and Berthe Weill. While residing at the Bateau-Lavoir Picasso painted works such as Garçon à la pipe (Boy with a Pipe) in 1905, and one of his most noted works, Les Demoiselles d'Avignon in 1907, considered by art historians as a proto-Cubist painting (the precursor of a movement that became known as Cubism). 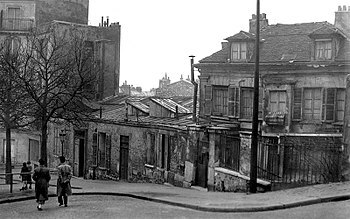 Following the outbreak of World War I in 1914, creative artists living at the Bateau-Lavoir and in the neighborhood began moving elsewhere, mainly to Montparnasse. In 1908, a celebration banquet for Henri Rousseau was organized in Picasso's studio in the Bateau-Lavoir. One night, Amedeo Modigliani destroyed a number of his friends' paintings while in an alcoholic rage in the Bateau-Lavoir, according to memoirs of his daughter, Jeanne. The Le Bateau-Lavoir is a featured setting in the 2018 season of Genius, which focuses on the life and art of Pablo Picasso. It is also featured in the 1995 Eric Rohmer film Les Rendez-vous de Paris. La Ruche, in Montparnasse, Paris. Wikimedia Commons has media related to Bateau-Lavoir. 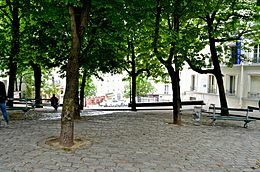 ^ "Montmartre". Paris Digest. 2018. Retrieved 11 August 2018. ^ Anderson, Darran (2013). Serge Gainsbourg's Histoire de Melody Nelson. Bloomsbury Academic. ISBN 9781623562878. ^ Harris, Jessica B (26 October 2017). "The Dinners That Shaped History". Magazine Section: The New York Times. Retrieved 30 November 2017. This page was last edited on 17 April 2019, at 11:32 (UTC).